What’s in Your Dance Bag, Michele Tobias? This is just some of the stuff Michele keeps in her bag. Yes, she usually has whatever you forgot and she’s willing to share. Snacks – granola bars, Luna bars, etc. An update: since the photo for this post was taken, Michele’s dance bag met with an unfortunate “accident” at the paws of her cat. Her dance bag, and some of the contents, were recently replaced. Michele has danced with the Pamela Trokanski Dance Theatre since 2009. More “What’s In Your Dance Bag” posts. 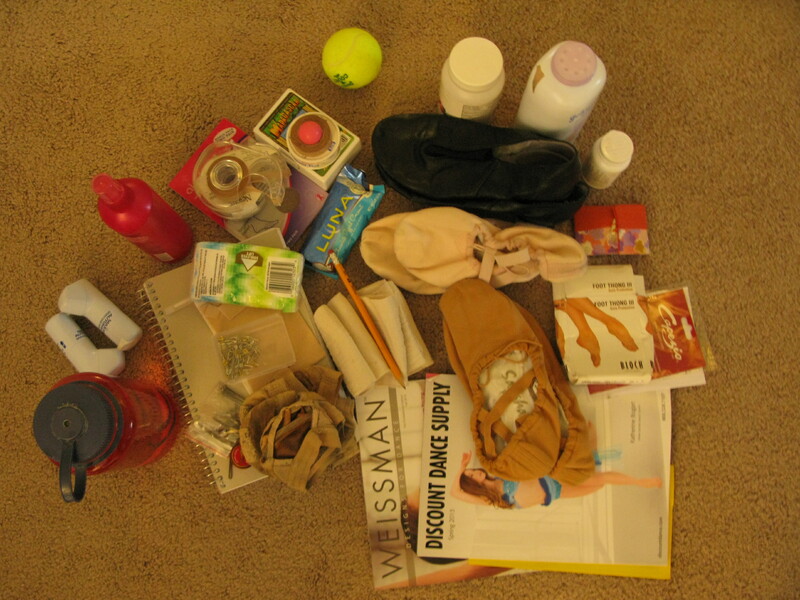 Tags: ballet, contemporary dance, dance, dance gear, dance tips, dancer, dancers, modern dance, Pamela Trokanski Dance TheatreCategories: Dancers, What's In Your Dance Bag? NextUshers: Superheros of the Theater!